In the previous pages we have seen how develop a web application with OBEROn; in particular how create web-forms to edit / show the property values of object instances and how these forms are displayed dynamically with Java Server Pages. Access through web-browsers is only one of the possible ways for connecting to the OBEROn database and performing actions with object instances: another modality is through portable desktop clients based on the Eclipse SWT library. - Application: is the basic class for desktop (SWT) applications. It includes connection methods and other utility functions. This is also the primary class for the administration tools: the "Enterprise Context Design" and "Domain Object Manipulation" consoles. 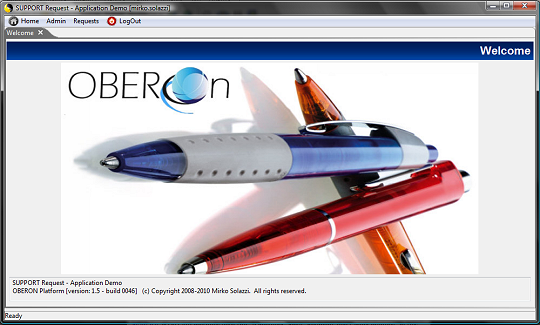 - OberonClient: is a primal SWT desktop client; custom SWT clients should extend this class. 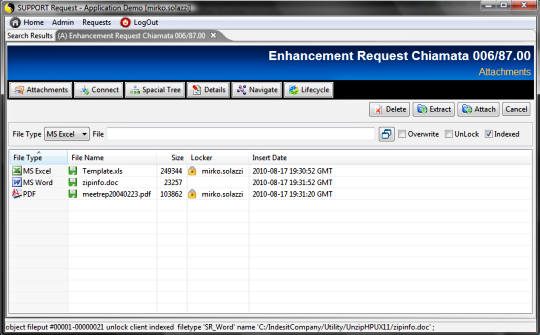 Desktop clients can be used inside the local intranet; in some cases they result faster than browser clients because the computational load is distributed to the client machines instead of to be concentrated in the application server. To reduce the network traffic the better configuration is to connect the clients through RMI or HTTP interfaces to an RMI / HTTP server. The OberonClient class contains all basic functionalities for developing a simple SWT application; you can open it by running the "startclient.bat" (.sh) script from the SO command line. The client reads some configuration parameters from the oberon.ini file; in particular if you set the configuration parameters "uid" and the "pwd" you can avoid (if they are correct) to authenticate yourself every time you open the client. 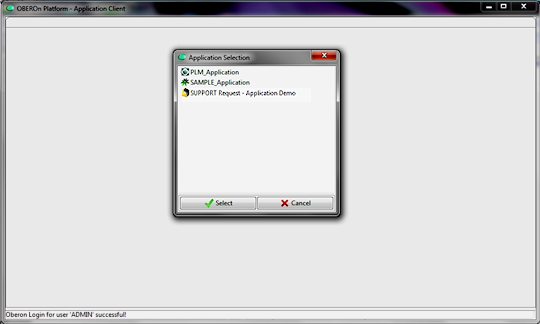 Moreover, you can set the "application" parameter to avoid to select the application on startup. Infact, the OberonClient is a generic client and it can act as the application you want to be. To define the possible actions that each user can execute inside the application you must create a set of commands organized into menus and submenus. Menus created for a web-application can be used also in desktop clients. The root of a menu/command structure represents the main-menu and so the application itself. You can set the "application" parameter with the name of the application (or portfolio) main menu or you can omit this parameter and select from the list of application menu roots. When an application menu is selected, the client loads its sub-structure, including the features representing the application parameters. The first "page" the client shows is the welcome page. The mechanism that is used inside the client to pass from a page to another is similar to the http request/response. The classes "ApplicationRequest" and "ApplicationSession" have the same behaviour of the well-known HttpServletRequest and HttpSession used in a web context. Note: page URLs inside the command Href parameter may start with the webapp relative path; for this reason you should use the "endsWith" or "indexOf" comparison operators instead of "equals". createPagePanel : prepares the page layout adding the title bar with title / subtitle, object contextual menu (when required) and manages error messages. The first page opened after the login is the TAGS.PAGE_Home (equals to "home.jsp") renderized by the doHome method. The following examples show how basic functionalities are implemented with SWT controls. The following method can perform both the object creation and the object data update (if the input ID is passed as input parameter). 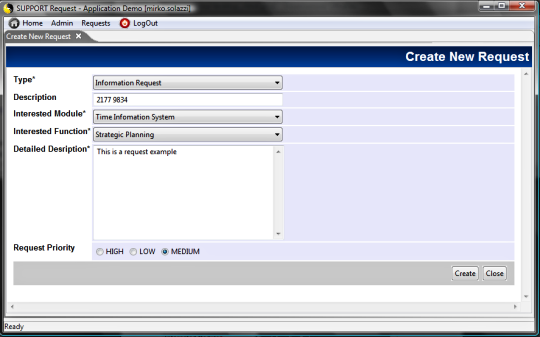 It also manages both the user interface for data input (createForm) and the database update process (saveFormData). These two methods are defined into the Forms class. 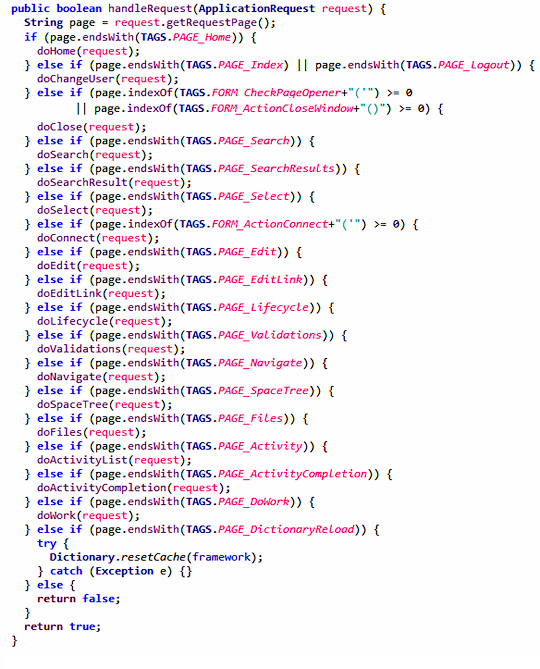 The Forms class represents the SWT implementation for the form administrative objects: in other words it generates the SWT java code based on the form parameters and on the form-item parameters, included all the code needed to load/refresh the field ranges and to validate the field-item values. The doSearch method is similar to the doEdit: it manages the user interface for the query input filters (createSearchForm); this method is also defined into the Forms class. It requires the search form name as input value and generates the SWT code based on this form parameters and on its item parameters. This method executes the search query based on the filters defined into the doSearch. 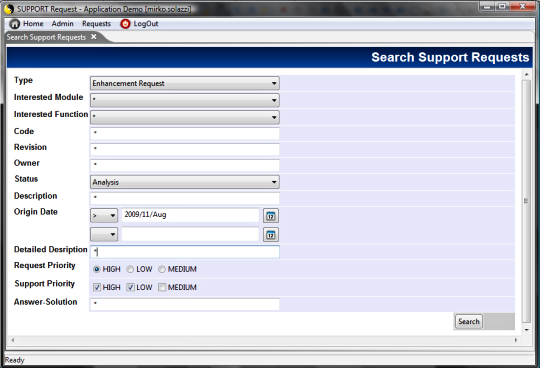 It employs the searchObjects method included into the Forms class. 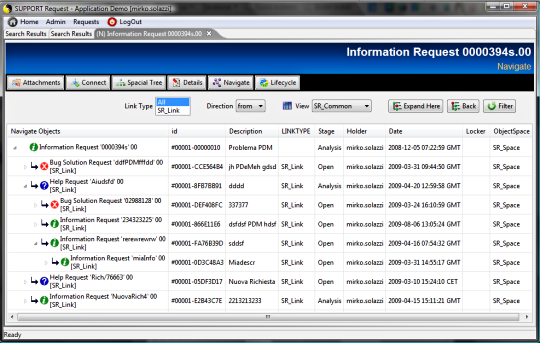 In addition, you can apply a view to the query results to extract and show several object properties. 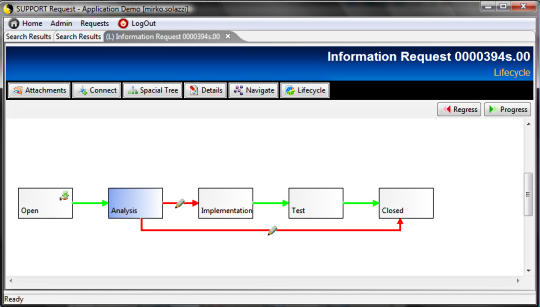 This method loads the object's lifecycle and generates its graphical representation. The user will be able to progress or regress the status and to validate/refuse the path validations. 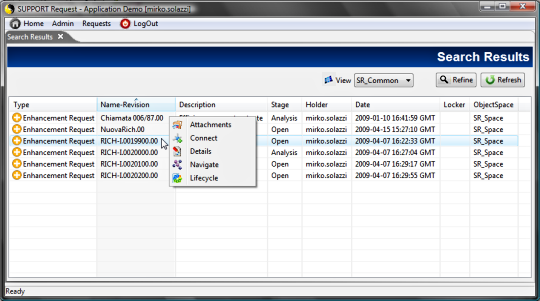 Shows the object's navigation tree: links can be filtered selecting the linktype and the direction. 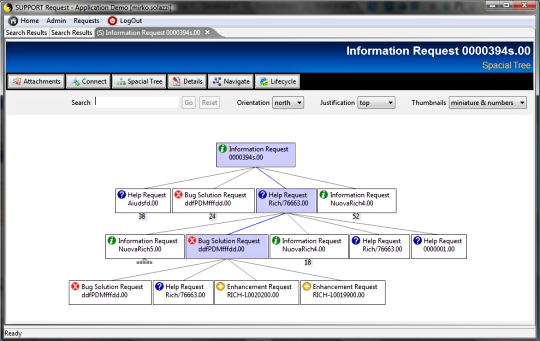 Visualizes the object's links by a spacial tree representation. Visualizes the user activity dashboard and open the default completion popups when Href is not specified in workflow steps. NOTE: for old versions before the 4.0, it's very important to note that if the application server connects to the database indirectly through a HTTP / RMI interface all java API methods with the "framework" input argument don't work properly. In this case (iit is a best practice to do it always) you MUST use the JRClient class methods to perform the operations.